4 of 5 DeliciScore™ (Great) Awarded to Joker Pub & Grill for their Burger Dip Sandwich in Issaquah, WA on this 20th day of November, 2016 - Wonderful yet tiny Burger Dip. Here Jessica and I are at the Joker Pub in Issaquah. It was a Sunday in November and the Seahawks were playing. Our current residence is without TV so we felt inclined to venture out to a sports bar to root on the 'Hawks as they took on the Philadelphia Eagles. The outcome was a good one! The menu. We were lucky enough to be there when the owner, who we had never met, was there as well. A table of folks next to us was partying it up and the people who we sat by were a very friendly couple originally from Toronto, Canada. 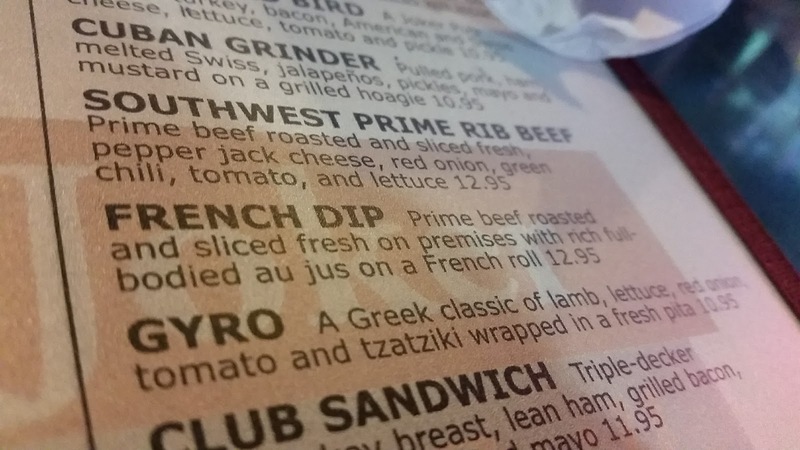 They have two dipped sandwich offerings on their menu: a French dip (which is actually a Prime Rib Dip) and also the burger dip. 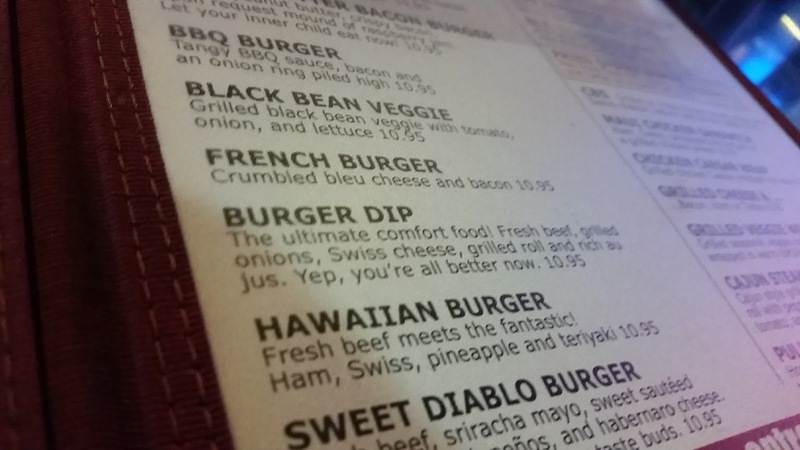 I was feeling more like a burger dip (not sure what it is other than the wholesome, meaty goodness of tasty burger). There's the burger dip and it comes with grilled onions and Swiss. Both wound up being good complements and the jus, as they had claimed, was indeed rich. 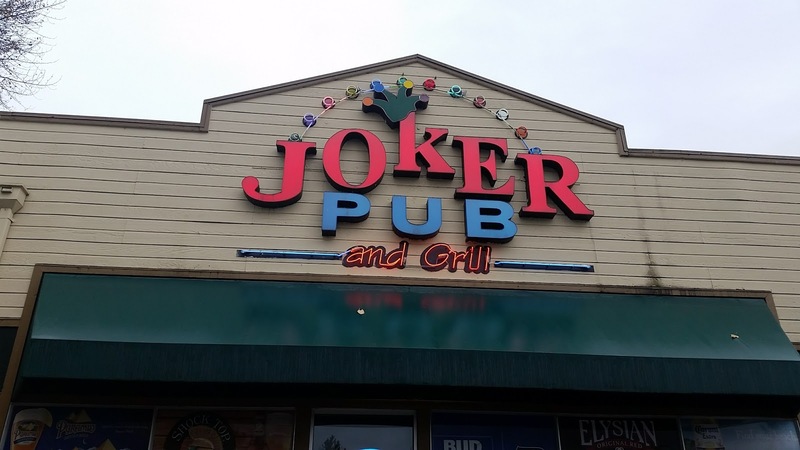 Good job, Joker! Here it is served. It looks really normal but I laughed out loud at the size of the bread, which is quite small. It is about the size of a hot dog bun, which I found a bit insulting and tricky. 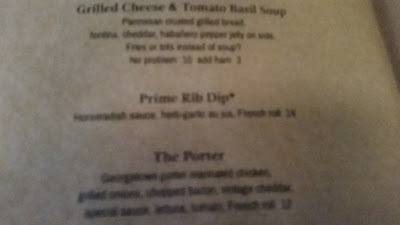 The side salad was fine, the jus looked dark. This meal followed a reasonable helping of Coors Light so I was ready. 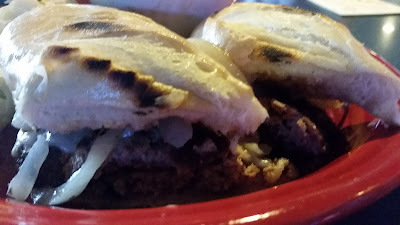 Close-up of the sandwich innards including the grilled onions. I'll have to get a better camera. Jessica was somewhat disappointed that the salad dressing was oozing all over the fork. I captured the disappointing situation. The bread was very tiny and pathetic hot dog-like if not smaller in size. LOL! I had never seen a sandwich that small even though the owner made if very clear that it was A THIRD POUND OF BEEF. Maybe true, sir, but the clear appearance of this sandwich is kind of silly. I suggested to him that there be a "regular" and "large" size of it. Perhaps a "hers" and "his" size. The bread was probably two inches wide. Sliders are bigger than this. That said, of the snakelike looks, it was very tasty and looked very high quality as well. Does size matter? 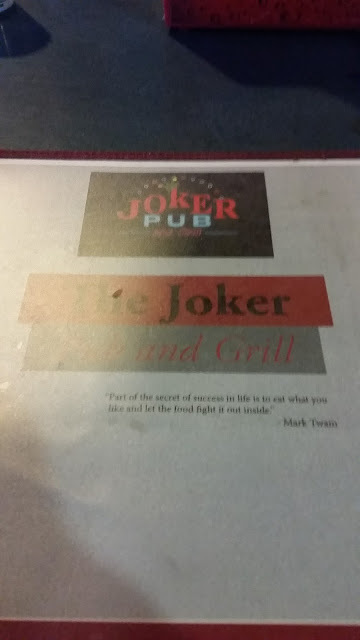 The grilled onion was good and added to my overall satisfaction in the meal. The Swiss cheese was well was generally additive. The bread, albeit small, was white yet fine, receiving a score a 3 of 5. The sandwich when eaten alone without jus was uninteresting but also beefy and good, although tiny. I give it a 3 and a 2 for size. The jus was indeed rich and quality as advertised, dark and good, winning a 4 of 5 possible points. The size of this sandwich was its biggest issue. Had it been a little larger it would maybe even have scored a 5 of 5. The meat was well done, good burger with a very pleasing caramelized flavor. 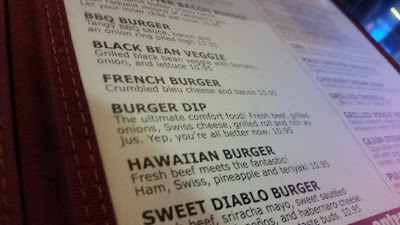 I truly loved the burger taste and texture, whereas Jessica claimed that she didn't love a burger dip. A burger dip may be my singular favorite food. So in total, this was a really good Burger dip but its biggest issue was small bread. It made me laugh how small it was. It was like a kid's toy. Very delicious and fine. Overall 4 of 5 for this really tasty burger dip that could have been a 5 had the size of the bread not been something from Honey I Shrunk the Kids. 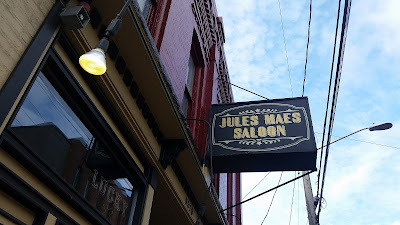 2 of 5 DeliciScore™ (Not Quite There) Awarded to Jules Maes Saloon for their Prime Rib Dip Sandwich in Seattle, WA on this 19th day of November, 2016 - What could be a good Prime Rib Dip. 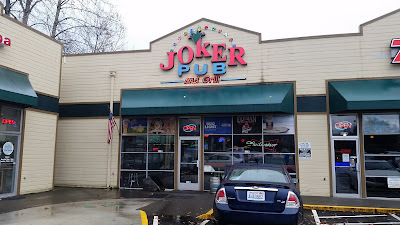 I was in West Seattle with a bit of time on my hands before recording my first ever podcast. I was super stoked for it and I thought I would celebrate the occasion with my favorite sandwich food. I sat at the bar. 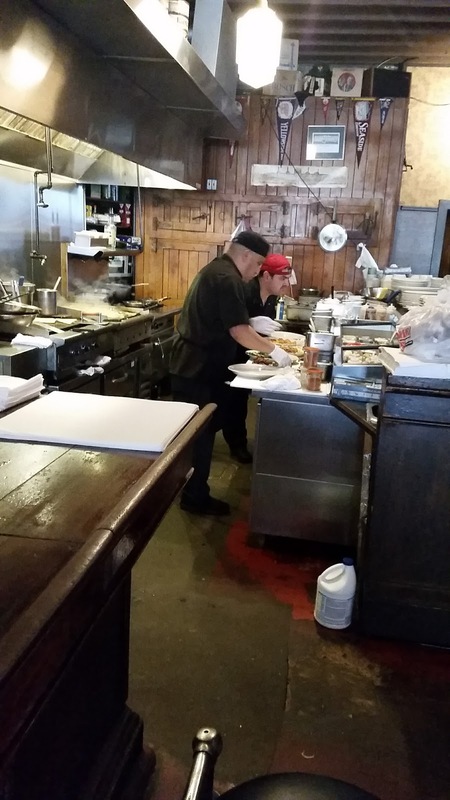 It was about 11 AM on a Saturday so it felt like the restaurant was filled with a perhaps hungover Saturday crowd. Georgetown is pretty casual and a bit hipster but there was a good mix of people in the joint: older people, younger people. 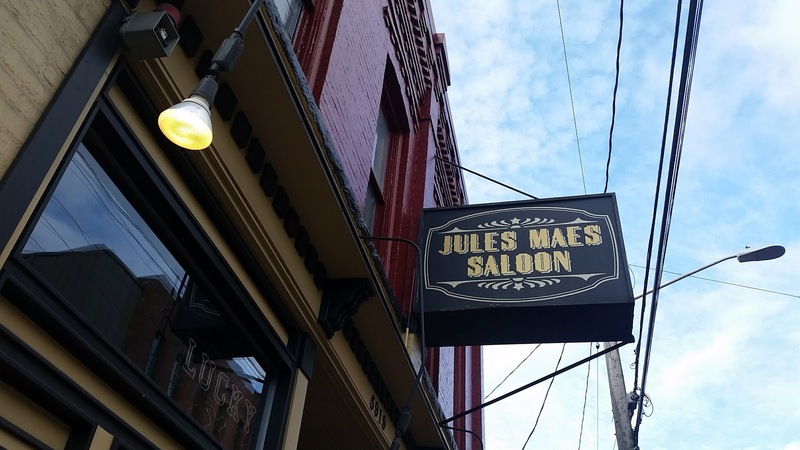 Jules Maes has a casual, neighborhood feel. I watched the cooks cook. Le Menu. I was excited. 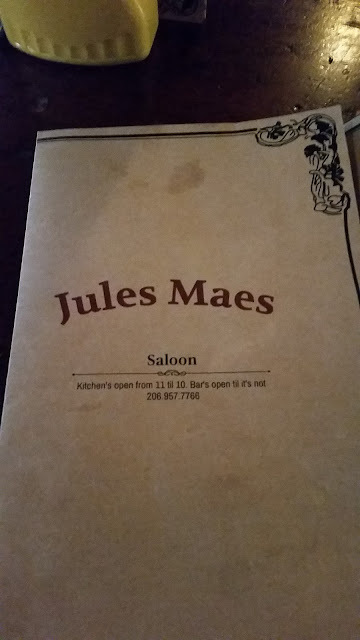 I had been to Jules Maes in the past and I think I have a memory of having their French dip before but I wasn't sure. I knew I had had their tater tots and thinking back on it, maybe that's all I should have gotten. Tots can be quite delicious, you know. Sorry for the lack of focus on this here picture. 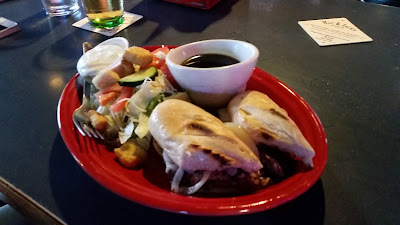 It says, "Prime Rib Dip: horseradish sauce, herb-garlic au jus, French roll. The grand total since I ordered a side salad instead of tots or fries as $20.08. Here it is served. The sandwich doesn't look too big or tall. Nothing too exciting about it. The sandwiches look a little floppy and sloppy and we'll get into that particular issue a bit later. My plate sat for about five minutes after the kitchen finished with it (I watched them set my plate down and counted the minutes as it got cold.) Sad. Overall, the bread was ok and perhaps even ideal: it was chewy bread and had a bit of a sourdough taste, I thought. Bread probably gets a 4 of 5. Since the sandwich sat for so long, I had to ask for hot jus and getting that took a long time, too (bad service). The woman behind the bar said she would get me some and then she never did so I finally begged for more from another bartender. When it came out the second time it was hot at least. As for how the green salad was: the Bleu cheese dressing was good, which was nice but by no means saved the meal. The salad was only okay and was not very big either (compare to the Georgetown Liquor salad that is served with their very delicious Picard sandwich). That thing was like a separate and delicious meal of food!). The sandwich came with the creamy horseradish pre-added. The consequence of this action was a greasy and wet texture of the sandwich. I wouldn't call it juicy, just greasy and heavy. They put a lot of care into their jus: it was dark and claimed to be herb-garlic, but I really didn't think it was that good. I give it a 3 of 5 for care but it didn't blow my mind or please me to the degree I would rather be pleased. The jus was dark, rich and authentic but it also had some kind of woodend and/or umami flavor, which didn't do it for me. It maybe needed to be tangy-er. 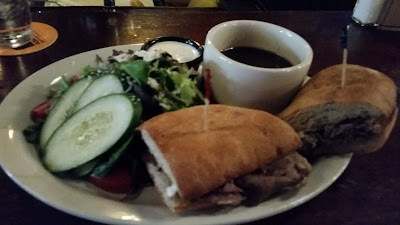 Overall I give this sandwich and meal experience a 2 of 5 due to bad service and a French dip that seemed greasy. 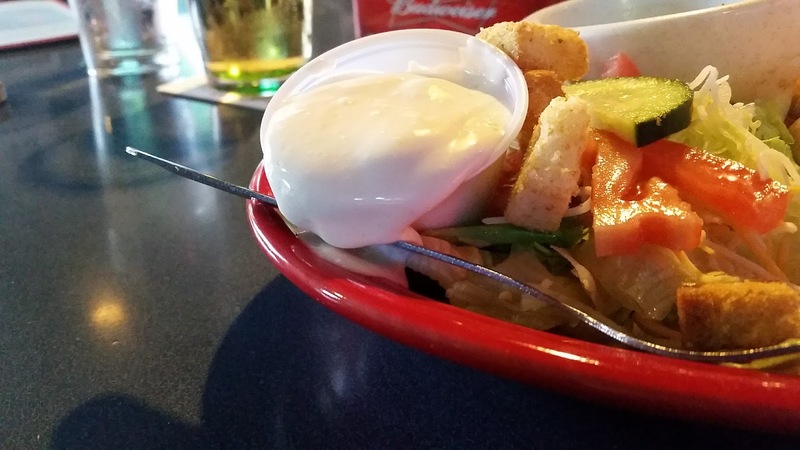 Next time I go I will A) get tots instead of the salad B) get the horseradish on the side and C) make sure that it comes out from the kitchen rapidly. I am not willing to settle for luke (warm? No, Skywalker, you inbred) jus.